Portable induction cooktops have recently become extremely popular and there are good reasons for that. In a nutshell, for those who are not familiar, induction cooking heats a cooking vessel by magnetic induction, instead of by thermal conduction from a flame or from an electrical heating element. ​On an induction cooktop, you usually find separate power and temperature controls as well as a programmable timer. Using the power controls is very much like increasing or decreasing the gas on a gas stovetop without having the flame. Using the temperature controls, you can select a particular temperature the cooktop will stay at during the length of the programmed cooking time, something you can not do with a gas or electric cooktop. Cooking with an induction cooktop is extremely fast and safe. With the push of a button the temperature changes instantly, and the cooking energy produced is supplied directly to your pot or pan. The cooktop will only heat the cooking vessel and not the surrounding air, promoting energy savings, safer cooking and a cooler kitchen. Faster and Precision Cooking: Heating is immediate and temperature selection is precise. Safer Cooking: There are no electrical coils or open flames, eliminating any risk of fire. Automatic shut-off feature enhances further safety. Portability: You can take portable induction cooktops anywhere you go! Use it indoors or out, just about anywhere with a standard U.S. electrical outlet. Eco-friendliness: Since there are no flames and no radiant coils, much less residual heat is produced in your kitchen and no toxins are released to the environment. Energy Savings: Induction cooking can conserve up to 90% of the energy wasted by traditional gas or electric stovetops. Ease to Clean: You just need to wipe the glass surface, casing and control panel with a damp cloth, or use a mild, non-abrasive soap solution. 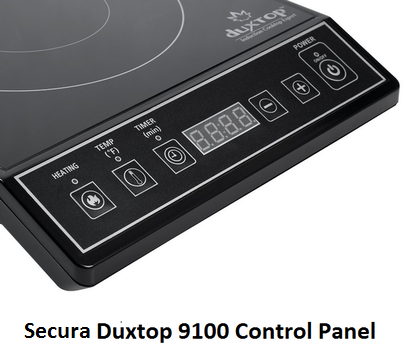 This article will compare the portable induction cooktops Secura Duxtop 9100, Max Burton 6200 and NuWave PIC Pro. These were not just the most popular among Amazon customers at the time this article was written, but they had also received excellent reviews from most Amazon buyers. Selected Portable Induction Cooktops on Amazon. The reason the number of temperature selections are different for the three induction cooktops considered here is because they each use a different temperature increment when temperature selections are made. For instance, NuWave PIC Pro has the highest number of selections (94), because it uses the smallest increment (5 degrees) when temperature selections are made using the "+" and "-" buttons, and Duxtop has only 15 temperature selections because it uses 20 degree increments when selections are made. With Duxtop and Max Burton, you increase the power level by pressing repeatedly the "Heating" (for Dutox) and "Power" (for Max Burton) buttons until the desired power level is reached. 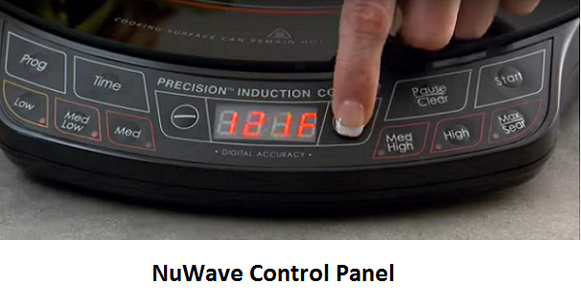 With NuWave there is no explicit power level button. Instead, it is equipped with 6 specific power levels to choose from: Low, Medium-Low, Medium, Medium-High, High and Max-Sear. Once you select a specific power level, you can either keep the temperature displayed for that level or increase/decrease the temperature using the "+" and "-" buttons. Note that the maximum power level that can be selected on NuWave PIC Pro is 1800W which corresponds to the Max-Sear selection on the control panel. All three cooktops are equipped with a timer. The maximum cooking time that can be set on Duxtop is 170 minutes, on Max Burton 180 minutes and on NuWave PIC Pro 100 hours! When cooking time is over all three induction cooktops considered here shut off. None of the three induction cooktops has an explicit "keep warm" function. But, as NuWave PIC Pro allows multi-stage programmed cooking, you can program a two stage cooking with the second stage being the "Low" selection for the desired length of time. This is equivalent to having a "keep warm" function. All three induction cooktops detect overheat situations and prevent accidents. They do so by switching to a lower temperature when overheat is detected and by notifying the user. The user has the option then of either further lowering the temperature, increasing it, or shutting down altogether the cooktop. All three induction cooktops considered here detect whether or not the cookwere used is induction compatible. For a quick test to see if your cookware is induction compatible, apply a magnet to the bottom of your cookware. If it sticks it will work! Note that if your cookware is not compatible, you could always use an induction interface disk (see below in Amazon products section). With NuWave PIC Pro, you can program multi-stage cooking. This will allow you to program both the temperature and time for each of the cooking stages of your recipe. 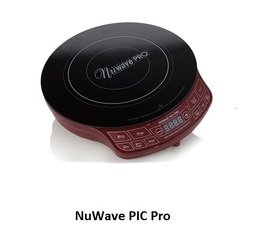 With NuWave PIC Pro, you can delay the start of the cooking for an amount of time that can be programmed. Delay timing can be combined with multi-stage programmed cooking. So which Induction Cooktop is best to buy? The three portable induction cookers considered here are excellent products as shown by the average rating each of them had received from Amazon customers at the time this article was written. Indeed, both Secura Duxtop 9100MC and NuWave PIC Pro had received 4.5 stars (out of 5 stars) and Max Burton had received 4 stars. There is a good chance that you would be quite happy with the results obtained from anyone of these three induction cookers. 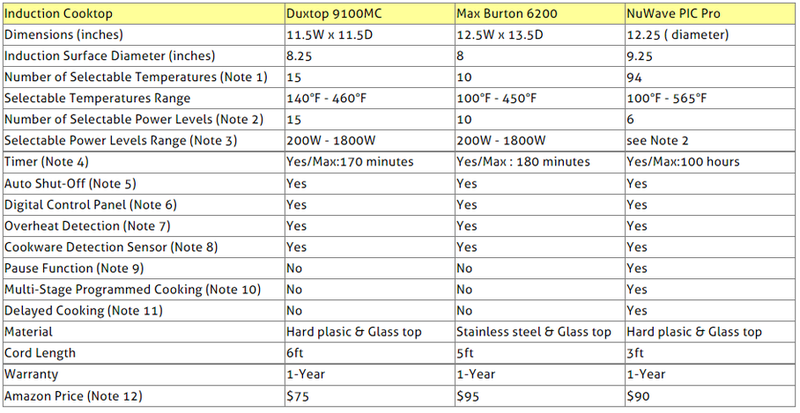 As you can tell from the above comparison table, Secura Duxtop 9100MC and Max Burton 6200 are quite similar. Except for the number of temperature and power levels that can be selected, they work quite similarly. Even their control panels (see above pictures) have the same number of buttons which are used to execute similar functions. One big difference, is that Max Burton has a stainless steel body with a glass top while Secura Duxtop has a hard plastic body with a glass top. Those who prefer stainless steel appliances might want to consider the Max Burton. Now, as it can also be seen from the comparison table above, NuWave PIC Pro comes with a number of useful features not available on Secura Duxtop and Max Burton. Features like delayed cooking, multi-stage programmed cooking and the ability to pause the cooking for a short while could be very useful under certain situations, but are only available on NuWave. In addition, though NuWave PIC Pro has only 6 power levels to choose from (as opposed to respectively 15 and 10 for Secura Duxtop and Max Burton), it provides a much larger choice of temperatures levels (94) that can be selected in conjunction with each of the 6 power levels, which means that it provides the user with more ways of cooking. ​If you consider that these points are important to you, then you should definitely consider the NuWave PIC Pro which is also quite similarly priced to the other two brands even though it comes with additional features. 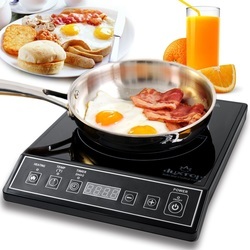 Please click the induction cooktop of your choice below for price information or to purchase. 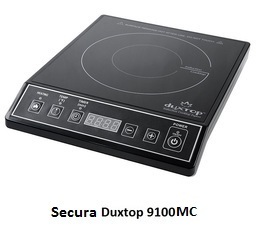 Are You Looking for a Double Burner Induction Cooker? Measures (23.5" x 14" x 2-1/2") and is suitable for use on a countertop. Can produce 1,800W of total heating power and runs off of a standard 110V outlet. Has a glass-ceramic cooktop that can easily be wiped clean with a damp cloth, once cool. Has a control panel with 10 quick-touch settings for adjusting burners from 150 to 450 degrees F.
Has built-in safety turn-off feature that registers when the cookware is removed from the burner and placed back on. 100% portable and can be placed wherever you have an outlet. Perfect for camping, barbecues, or for special occasions when extra burners are needed.